jewish-black | Stop Dog Whistle Racism! In other words, McCain’s latest campaign strategy. 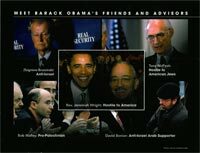 We saw it in Pennsylvania, where prominent Republicans sent out an e-mail to Jewish voters likening the situation in 2008 to the situation in Europe in the 1930s and ’40s (with Obama akin to Neville Chamberlain, an enabler of evil then the Nazis, now Iran). And we’re seeing it again in a new McCain ad likely to be aired in Florida (if it hasn’t started airing already). Via Benen , the ad says this: Iran. Radical Islamic government. Known sponsors of terrorism. Developing nuclear capabilities to generate power’ but threatening to eliminate Israel. Obama says Iran is a country, doesn’t pose a serious threat. Surprisingly, the poll found that gap widened to nearly 40% among Jews who rank Israel “very high” as a factor in their choice of candidate, indicating that Israel is a key issue for Jews across the political spectrum. “Jews always look at candidates in their own camp as more sympathetic to their positions as Jews, so liberal Jews will tend to feel Obama is more pro-Israel than conservative Jews do,” lead researcher Steven Cohen, a professor of Jewish social policy at Hebrew Union College, told The Jerusalem Post. Orthodox Jews – a category that encompasses Modern Orthodox and haredi respondents, Cohen said – were the likeliest to support McCain, with 73% indicating support for the Republican over just 27% for Obama. Support for McCain was highest – 90% – among Orthodox Jews who said they socialized exclusively with other Jews, while only 60% of Orthodox respondents who said they had non-Jewish friends planned to vote for McCain. 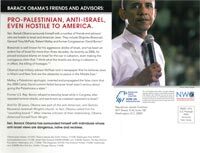 Jackson believes that, although “Zionists who have controlled American policy for decades” remain strong, they’ll lose a great deal of their clout whenBarack Obama enters the White House.